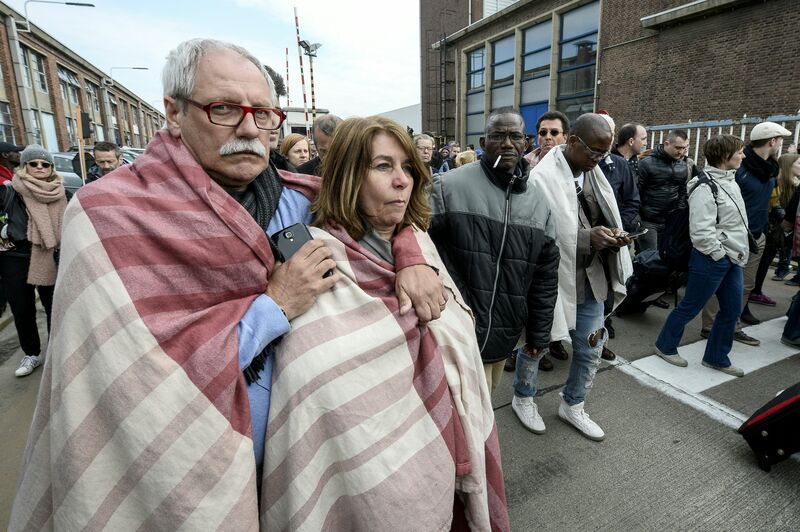 Tuesday morning, Belgium became the victim of what is being called a terrorist attack. After two explosions at Brussels International Airport and one at Brussels' Maelbeek Metro station, Reuters reports that 34 people have died, with many more sustaining injuries. Naturally, there has been an outpouring of support for the people of Brussels and the victims whose lives were lost in the attacks, as well as those still fighting for their lives. The world has turned its attention to Belgium, but with that come some uncomfortable truths, like the one expressed in a new political cartoon about the Brussels attacks. The cartoon depicts a Belgian man holding a sign that reads "Je Suis Bruxelles" which translates to "I am Brussels," mirroring the phrase used in the wake of the Paris attacks. The title, "Le Terrorism A Encore Frappe," translates to "The terrorism strikes again," and opposite Brussels are the thousands of other locations attacked by terrorists in recent months, including Paris, Kenya, and Mali. The man from Brussels humbly asks, "Vous me faites une petite place?" or "Can you make a little room for me?" The visual is almost debilitating, with its crowd of representatives of locations rocked by terrorism; there are too many to fit in the frame, with many disappearing into the background. It seems dramatic, but it isn't at all unrealistic. The cartoon is not only heartbreaking, but also an important visualization of the reality of any terrorist attack. It's not just about this one city, today. It's about all of us, and every victim who came before the Brussels attacks, and sadly, even those that may come after. In one dark but spot-on cartoon, we get a picture of just how far terrorism reaches. We also get the extremely important message that no one act means more or less than another. Every act of terrorism is horrible and heartbreaking, regardless of where it takes place, and every last victim demands our support.